Bright, crisp and slightly sparkling; Vinho Verde is a perfect summer wine. On a particularly hot day several years ago, I decided to broaden my wine horizons. I'd been slowly drinking my way through WineWise, an informative wine primer published by the Culinary Institute of America. In the chapter on Portuguese wine, the authors suggested that a first glass should be a "low-alcohol, dry, crisp, white Vinho Verde wine." Most of these, they wrote, cost less than $10 a bottle. It sounded like the perfect fit for my sweltering day. I found a bottle without difficulty and twisted open the screw cap before pouring it into a glass. First, the smell; it was bright, almost lemony. As I gently swirled, I noticed that it was very slightly sparkling. I was intrigued. One sip revealed a very dry but fruity wine. I almost had the sense that I was drinking some sort of wine-based lemonade or housemade soda (but less sweet). That summer, Vinho Verde became the wine I kept in the fridge, pouring a glass in the evenings to enjoy on my deck. I was amazed at how long it held its sparkle. It turns out that I'm not alone in my love of this summer sip. There are many reasons this wine has captured the hearts of those wanting to relax in hot weather. So recently, I met up with Eric Sloane, wine steward at the Yoke's Fresh Market on Argonne Road, and a former assistant winemaker with Nodland Cellars and former assistant sommelier at Beverly's, for his take. "I've always loved it as a summer wine because it can take a full chill," he said. "Most white wines are consumed too cold. They're richer; the aromatics are better when they are a little bit warmer. There's a few white wines: Sauvignon Blanc, anything with high acidity that's not extremely aromatic, which are really good chilled down. Vinho Verde is one of those." No wonder it's such a good fit for a cooler. To understand Vinho Verde (pronounced VEENG-yo vaird), it helps to know a bit of geography. Like Burgundy or Champagne in France, Vinho Verde is a wine-growing region in northern Portugal. Wine has been grown there for more than 2,000 years. While the most common wine you're likely to get from this region in the U.S. is the light, white version, it also produces red, rosé, and sparkling wines. One might wonder why a name that translates to "green wine" also covers red and pink versions. This "green" doesn't refer to the color, but instead hints that this is a wine best consumed young. It's usually released 3 to 6 months after harvest (compared with years after, for some other wines). While most Vinho Verdes are white blends, they likely aren't grapes that you've heard of before. The most typical are Alvarinho (called Albariño in Spain), Loureiro, Trajadura, Azal, Pederña, and Avesso. "It's very much a café wine, like a rosé in Paris," says Sloane. "These are wines of the people. They generally just know a guy who has a vat and they go fill their carafe — their growler, in American-speak. They take it home and drink it as an everyday wine. It is a little bit lower in alcohol, so you can drink more of it." While Vinho Verde is excellent on its own, it's also quite food-friendly. Pair it with spicy dishes, or fish, similarly to a Sauvignon Blanc or a Pinot Grigio. 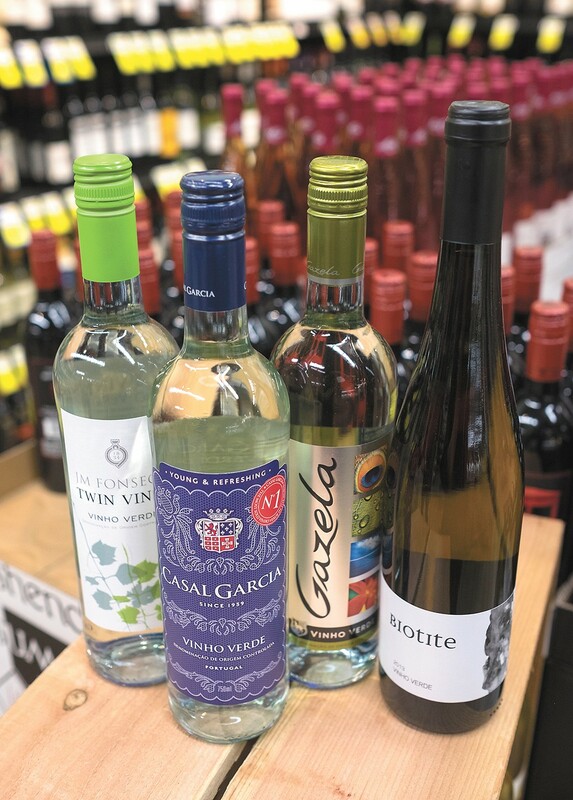 While Sloane sees the value in the most readily available Vinho Verdes, he is particularly excited about white wines that are taking some winemaking risks (these were called "Super Verdes" by the Wall Street Journal in 2014). "They're taking the complexity level up a couple notches, which may not be right for everyone, because those wines are definitely more powerfully flavored, more intense," says Sloane. "Those are definitely brighter, the acidity is more laser-beam than diffused. They have an introduction of secondary flavors like chalkiness, and even a little bit of saline, where with the Vinho Verdes available every day, fruit is the primary characteristic. There's not a lot of secondary or tertiary characteristics." Unlike entry-level Vinho Verdes, those from smaller producers are usually completely still. The hint of sparkle originally occurred when small amounts of CO2 were trapped during bottling, but now many producers add CO2 because people expect it. Personally, I love the spritz of bubbles without opening a bottle of sparkling wine.